Network Time Protocol (NTP) is used to synchronize a device clock with external NTP server. You can configure a Cisco IOS router as NTP server by configuring “ntp master <stratum> ” CLI command. Stratum indicate how many times information (time-snyc) being relayed. For example your router is connected to a IP clock directly then stratum is 1. Switches cannot be configured for this command as it is not supported on those platform. But when a switch get time from external source, it can relay the time information to other devices on your network. In other words the given switch (let’s say CAT2) has been configured as client (for an external source – CME) then other devices (CAT1, CAT3, CAT4) can be configured as NTP client of CAT2. In my CME router configured for external time server & get the time from that. Let’s say we want to make that NTP master with stratum 2. If you want to specify the source interface of NTP packets you can use “ntp soure <interface>” CLI command. So here is my configuration in CME. Now you can configure all your internal devices to sync with CME by using “ntp server 10.10.205.20” command. But in this exercise we will configure CAT2 for that & make other switches get time from CAT2. Here is how you can configure it & verify on CAT2. I have made ntp source as vlan 10 (this is not mandatory). Note that stratum is 2 which is configured on our CME. Here is CAT1 configuration & verification. Note that stratum has changed to 3 which indicate an additional hop in the time relaying process. Now let’s add some complexity with Authentication. In NTP, client is the one who needs to authenticate NTP server is valid (Not like normal client-server environment where server authenticates client). Therefore you have to configure NTP authentication commands on client devices & only ntp-key is required to configure on NTP server. Here are the NTP authentication configuration required at client (CAT1) device. Now you can verify proper NTP authentication on client by using “show ntp association detail” command. Here is the output at CAT1. You can configure an ACL to control what devices can get time from your NTP server. In our example will configure an ACL on CAT2 & control what devices can get time from that. Here is the configuration syntax for that. 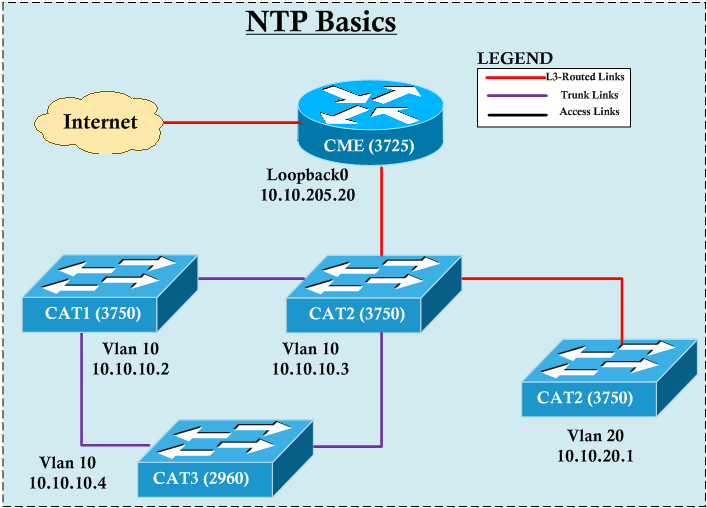 Here is the CAT3 & CAT4 configuration & verification of authenticated NTP time synchronization. interval       Configures the Network Time Protocol Polling Interval. key-auth       Configures the NTP authentication key. 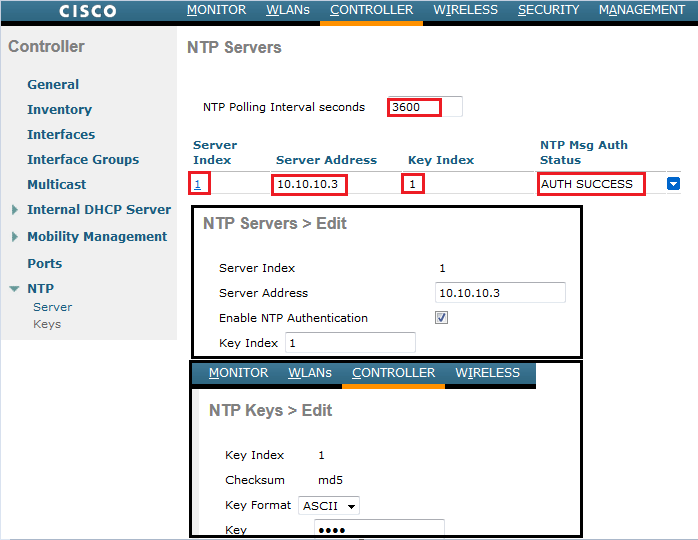 (WLC3) >config time ntp key-auth ? add            Choose add to Enter a NTP authentication key. delete         Choose del to delete the NTP authentication key. (WLC3) >config time ntp key-auth add ? <key_index>    Enter Key index between 1 . . 4294967295, Any Value more than this will be ceiled to 4294967295. (WLC3) >config time ntp key-auth add 1 ? (WLC3) >config time ntp key-auth add 1 md5 ? ascii          Key format choose ascii type. hex            Key format choose hex type. (WLC3) >config time ntp key-auth add 1 md5 ascii ? <key>          Enter key, Maximum of 16 characters. (WLC3) >config time ntp auth ? (WLC3) >config time ntp auth enable ? <server-index> Enter NTP server index. <key-index>    Enter Key index between 1 . . 4294967295, Any Value more than this will be ceiled to 4294967295. (WLC3) >config time ntp interval ? <interval>     Enter NTP polling interval, between 3600 and 604800 (in seconds). Remember to add WLC management IP to NTP ACL you created on CAT2. You can verify by looking at the ACL hit count incrementing. Here are the WLC GUI looks like once you configured this. Source interface BVI1 is configured. Before we finish there is one more setting associate with time known as time-zone. This setting is local to the device which you configure. For Routers, Switches or Autonomous AP command will be “clock timezone <name> < delta> ” . See below example which I have configured my devices to AEST (Aus Eeastern Standard Time) with +10 hr to UTC. (WLC3) >config time timezone location ? <location_index> Enter the timezone location index. That’s all what you need for NTP configuration & it is really important to all of your devices in the CCIE lab synch properly. This is one of the configuration you have to do early in the lab exam. You said “Only authentication key to be configured on NTP server (CAT2)”. But you need trusted-key command on NTP server as well to enable authentication? “ntp trusted-key” command configured on client side in my example. It is not mandatory to have it on server side. Remember it will work even if you configure it in both ends, I have used minimum configs required to get this working, you can add more config if needed. Yep, it looks likes a bug. Hi Nayarasi, i need some assistance please. What is the implications of setting the wlc NTP/clock back to 2014 and we are in the year 2017 ( this is to ensure old APs join the controller – Mic issue). When R1 send NTP packets, if will source from Loopback 0 IP address. On e0/0, “ntp disable” command will prevent receiving NTP packets from this interface. “Use the ntp disable command in interface configuration mode to configure an interface to reject NTP packets. If the ntp disable command is configured on an interface that does not have any NTP service running, the interface remains disabled even after the NTP service is started by another NTP configuration. When you use the ntp disable command without the ip or ipv6 keyword, NTP is disabled on the interface for all the address families.